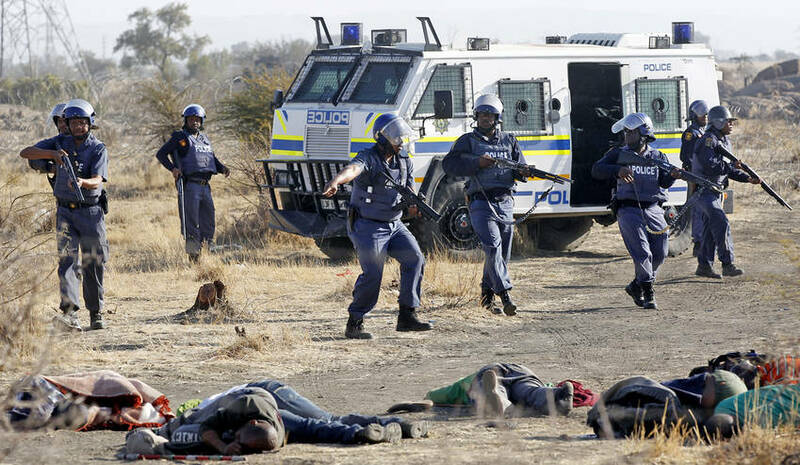 On 16 August 2012, the South African Police Service (SAPS) opened fire on a crowd of striking mineworkers at Marikana, in the North West Province. The police killed 34 mineworkers, and left 78 seriously injured. Following the open fire assault - 250 of the miners were arrested. This event culminated after an intense week-long protest in which the miners were demanding a wage increase at the Lonmin platinum mine in a wildcat strike. A wildcat strike, or 'unofficial industrial action', is strike action undertaken by unionised workers without the union-leadership's authorisation, support, or approval. On 9 August about three thousand miners went on strike to demand a living wage. On 10 August, a large group of the striking miners approached the National Union for Miners (NUM) local office in order to demand support from their union, and were instead met with the firing of live ammunition, fatally wounding two miners. This fatal breakdown in communication between the miners and their union further aggravated a volatile situation, in which the miners and their families were desperately trying to have their voices heard and their needs met. The miners were unable to attain a meeting with NUM or Lonmin representatives and events became increasingly militaristic following the death of the two protesting miners. Between 12- 14 August at least four miners, two police officers and two security guards died in the ensuing violence. On 13 August, 30 miners were delegated to cross the veld (field) that separated them from another Lonmin platinum mine, Karee, where miners were also undergoing a wildcat strike. The 30 miners were forced by security to turn back without being allowed to meet with miners on the other side. On their way back they were met with a contingent of police. Eye-witness reports say there were about 10 nyalas (military police vans) and two police trucks. The police barred their way and told them to lay down their weapons (machetes also known as pangas), to which the workers refused, saying they needed the pangas for everyday living in the 'bush'. The police allowed the miners to continue, but once they were about 10 metres away, the police allegedly began to open gun fire (rubber bullets and later live ammunition) on them, and the miners retaliated. Two policemen and two miners were killed in this battle, and one miner injured severely. The strike continued despite gaining no support from NUM and receiving no official commitment from Lonmin management to enter into negotiations. The strike was for a wage increase and to address the poor living and work conditions of miners and their families in Marikana. These issues were not formally addressed by the NUM or by Lonmin during the protest. Many of the strikers instead began losing their jobs and the protesters were met with unrelenting hostility by security, the police, and union personnel and management. Despite having no legal protection or union support, thousands of miners continued to strike in solidarity for their common goal - a better quality life and the dignity it affords. The families of the striking miners were also in general solidarity with the protest and worked to support the movement, joining in protest action and bringing supplies when necessary. 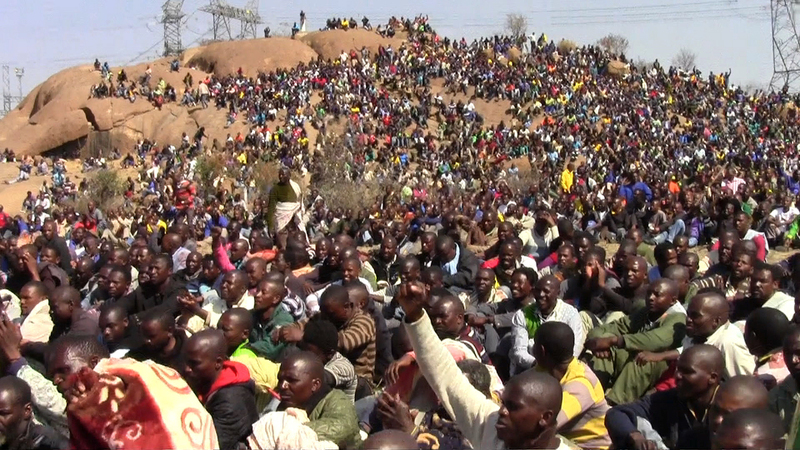 Striking mine workers gather on hill on 16 August 2012, before massacre occurs. 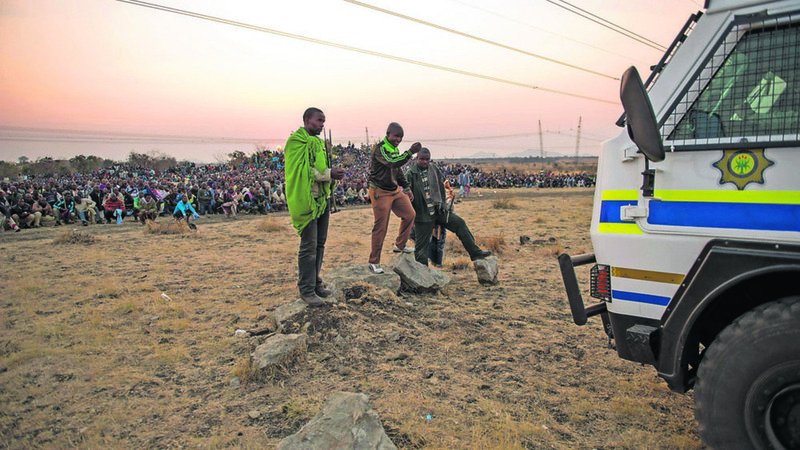 On 14 August Lonmin officially halted production at the Marikana platinum mine. The miners set up camp on a hill called Wonderkop near the Lonmin mine. Police and miners occasionally entered into discussions however the miners remained steadfast in their strike action, and on 16 August a full frontal attack was launched on them. More than 400 police were deployed, most in camouflage military gear and armed with R5s, a licensed replica of the Israeli Galil SAR, or LM5 assault rifles, designed for infantry and tactical police use. A barb wire fence was set along the outside perimeter to close the miners in, and military police vehicles and helicopters were deployed on the scene. The police were deployed in a manner that caused concern among the strikers. Despite statements that the police were acting in self defence, it is considered by many that they were not in any real danger. About a dozen miners were caught on camera being shot at directly, and this footage has received global attention and outrage. However most of the miners who were killed and injured were not caught on camera, with some of the miner's bodies reportedly discovered behind boulders and in retreat. Many of the slain and injured had gunshots in their backs and there were miners who were found with injuries of being ridden over by nyalas. Not a single policeman was killed or severely on 16 August 2012. Addressing a press conference, SAPS authorities claimed its officers opened fire on the miners in self-defence, after the miners attempted to attack them using machetes, spears and clubs. The official number of people killed was confirmed by National Police Commissioner General Riah Phiyega, weeks after the incident. Among the miners killed, was Mgacineni “Mambush” Noki, Bongani Nqongophele, Janaveke Raphael, Van Wyk Sagalala, security guard Matlhomola Mabelane, Andries Ntshenyeho, Xolani Nduzuzu, Telang Mohai, Thabile Mpumza, Stelega Gadlela, Thabiso Thelejane, Thabiso Mosebetsane, Jackson Lehupa and many others. The Marikana Commission of Inquiry was set up to investigate the massacre of miners at Marikana. The commission’s first seating was on 1 October 2012, its final sitting was on 14 November 2014, and its report was submitted by President Zuma on 31 March 2015. The report absolved the key political figures who were accused of having a hand in the events leading to the massacre, including Deputy State President Cyril Ramaphosa who at the time of the massacre was a non-executive director at Lomnin, former Police Minister Nathi Mthethwa, former Mineral Resource Minister Susan Shabangu and the National Police Commissioner Ria Phiyega. It also found that Lonmin had failed to engage with workers and the trade unions operating in that sector, NUM and AMCU, were found not to have had full control of its members who embarked on the unprotected strike. South Africa is world’s third biggest producer of platinum, one of the highest trading resources on the market. Lonmin had 28 000 miners in its employ and has since retrenched thousands of its workers. Families of the miners slain and injured are still seeking reparations.